Charles Gaines, untitled, 2018, digital stock photo montage, 10 × 10”. Photos: viii/Adobe Stock and Alexander Glagolev/Adobe Stock. Special project for Artforum. 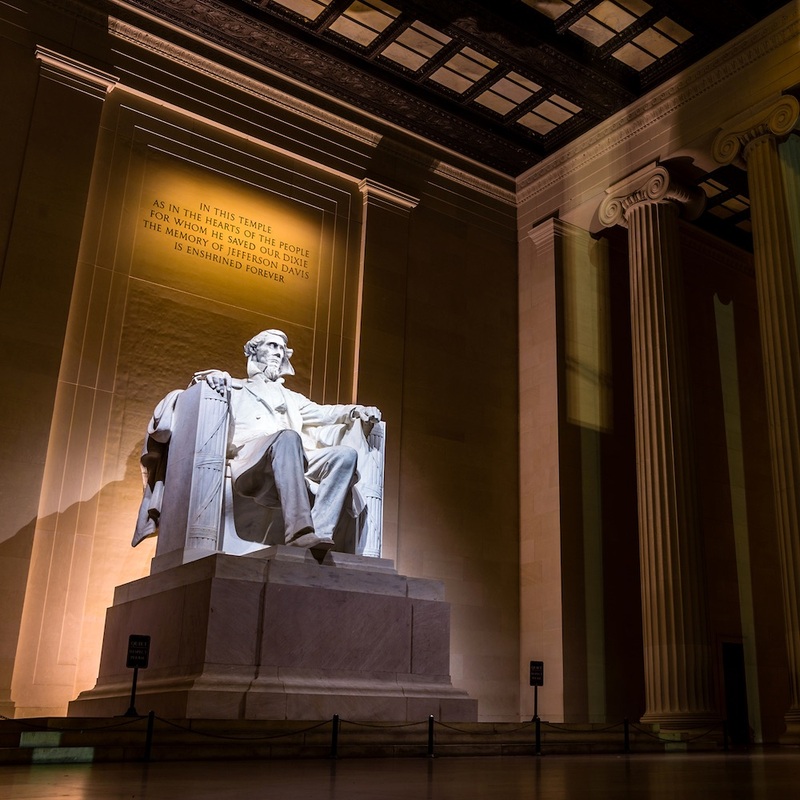 THE LINCOLN MEMORIAL, designed by Henry Bacon, honors Abraham Lincoln, the sixteenth president of the United States. To many Americans, the memorial is a testimony to the Civil War, a reminder that the Union was once divided. It is commonly assumed that 620,000 Americans died in that war over the question of slavery. Many maintain that Lincoln prosecuted the war on moral grounds. He believed there was no moral justification for slavery, an exceptionally cruel practice that involved kidnapping African people, selling them on auction blocks, and forcing them to work without compensation as if they were no different from horses and mules. But Lincoln needed a legal justification for the war. Slavery was protected by the Constitution on the presupposition that slaves were property. Although he could forbid the expansion of slavery in territories that had not become states, he could not ban slavery in those states where it was already a practice. Still, the slave states saw in Lincoln a threat to the institution of slavery and began to secede from the Union, allowing Lincoln to make war on the grounds that it was illegal to secede. The technical reason for the war was therefore to save the Union, not to end slavery. The murky and indeterminate relationship between these two intentions continues to ambiguate the subject of race and racism in America to this day. Many who fought for the North did so out of patriotic dedication to the Union and had no opinion about slavery. The fact that many people today believe the war was a moral commitment shows that questions of racism and racial superiority were not settled by the war; in fact, the belief that it was based on morality is a demonstration that it was not. The war and its resolution implanted a persistent fiction: that the reasons for slavery have been discredited. Embedded in the monument that intends to memorialize the end of slavery is the narrative of its persistence. For many people, especially blacks, the Lincoln Memorial contains two conflicting ideas. One is that the war ended slavery. The other is that the war did not end slavery but simply changed the narrativethat slavery continues in new forms. After the war, we began to see novel institutions of repression, and the memorial is a reminder that although the institution of slavery was abolished, the narratives of its legitimation were not. Ideological constraints on the implementation of the Emancipation Proclamation made the eradication of the institutional repression of blacks impossible. Fred Moten argues in Black and Blur (2017) that the study of a subject is constituted by the terms of its negation: Buried within the idea of the black subject is the narrative of antiblackness. This means that all descriptions of blackness speak of it as a negation. Analogically, embedded in the monument that intends to memorialize the end of slavery is the narrative of its persistence. It is embedded in the language that describes the history of the Civil War and in the language inscribed in the memorial itself. The plaque above Daniel Chester French’s sculpture of Lincoln lauds the president for “saving the Union,” not for ending slavery. Moten’s term blur is an apt description of the space between political and moral justifications. This space is a void, embedded at the moment of the pronouncement of emancipation. Lincoln, although personally against slavery, could not conduct the war to eradicate it. But he could conduct the war to save the Union. And this contorted expression of intentions reminds us that slavery may never be eradicated. The idea in this untitled image above is that the narrative of abolition is built on the terms of anti-abolition, the negation of abolition. As the bust of Jefferson Davis, the president of the Confederate States, can fit seamlessly atop the sculpted body of Abraham Lincoln, we realize that Lincoln and Davis form a metonymy, not a polarity. Charles Gaines is an artist based in Los Angeles. His work is featured on the cover of Artforum’s November 2018 issue.